Hi again, Mike! 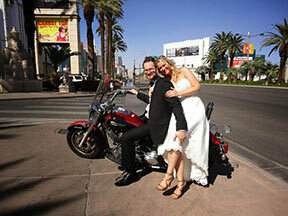 As promised a picture of us at the Strip on our wedding day. Thanks again for making our honeymoon a possibility and your friendliness and help with everything! The 3 weeks riding in awesome landscape was the best trip we’ve ever had. And we definitely got our money’s worth. Hope to see you again soon! Hello, Mike. 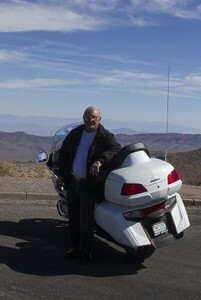 Thank you one more time for giving us opportunity to ride two short weeks on 1100 cruiser in Arizona winter. There were: Great places. Cool road motels & Mexican restaurant for truck drivers. Great weather including rain in desert. Great fuel prices thanks to Uncle Sam. Great rental offer including comfort seat for passenger and top bag for cruiser combined with The Greatest attitude (that is the most important for good trip). Thanks to Mike! 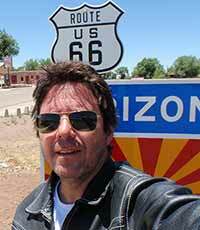 All of the above makes Bikers West a place we definitely will come back when travel Amerika next time. Hi Mike. I want to sincerely thank you again for the great Service and the well maintained Motorbike You provided for my 3 Week Trip around California, Utah and Nevada! Not only you picked me up near the Airport, but I also could leave some Luggage behind! 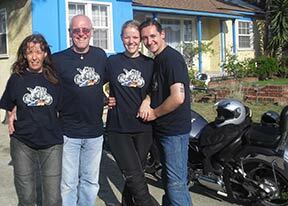 The Goldwing 1800 was perfect for the Trip and in perfectly safe Condition! Mike, I am so looking forward to do it all over again and will come back to you as soon as possible! Stay healthy and Thanks again for Everything! Cheers! Trying to organise a `bike` holiday in California from Scotland is not simple. Even with the internet, you find companies don’t email you back and phoning with an eight hour time difference can be difficult if you can’t speak to the right person when you phone. Add to this the fact that the other two in our group (with my wife and myself) are from Germany, things didn`t appear easy. 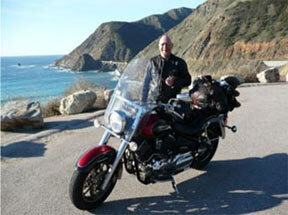 Enter Mike at Bikers West, a real `gentleman`. Great communications from him made things so straightforward. The website is easy to follow, but he was also very helpful with other info including telling us places of interest we might not have known about and many tips about how to tackle our trip. Great reliable bikes, maps, helmets, gloves, saddlebags, water bottles for desert riding, insurance and picked up and dropped off at our hotel before and after trip all included in one very competitive price. The bikes ran absolutely trouble free from beginning of trip to end, even after one night when we were holed up in a motel hiding from a desert downpour which cut off half the electricity in town (Needles). The bikes were not covered but started first turn of the key next morning. What else can I say? Ok, 2 things, I HIGHLY recommend Bikers West and if I ever have the chance to get back I would definitely be contacting Mike again without considering anyone else. A great big thanks to Mike and if anyone wants my email address for verification from me I`m sure Mike would pass it on to you. Mike, I didn’t have the the opportunity to thank you. The bike was perfect and the trip wonderful. My dream was realized. Be sure that now you have a Brazilian friend and client. We are two guys from Bavaria, Germany, and we had a really fantastic trip around the west of the U.S. We made nearly 4000 miles in 4 weeks, took a bucket full of impressions back to Germany and met a very nice guy named Mike, who made this fantastic trip happen with his bikes. 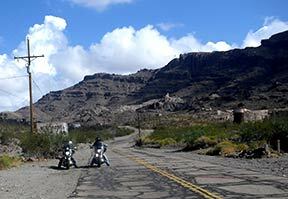 The 1100 cc V-Stars made the trip without any problems and didn´t let us down once. Thank you very much for this great holidays, Mike! Once again, I wish to thank you for your part in making my winter respite from our Canadian winter a most pleasurable experience. I’ve returned home to Ontario, Canada none the worse for wear and I have some really wonderful memories of my trip. 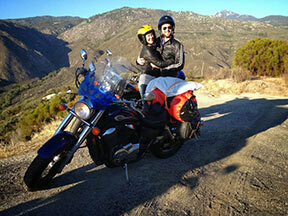 One of the highlights was meeting you and renting a V-Star 1100 from you for my ride up the west coast. I have been singing your praises since my ride, at every opportunity. To find someone in business whose MO is customer service first these days is somewhat like striking gold and an example that other businesses should surely follow. 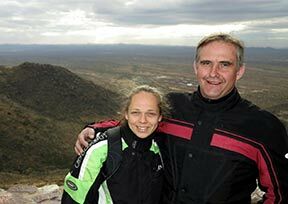 Let me say, unequivocally to any prospective motorcycle renter: You’ll not likely find a better place to rent than Bikers West and you are simply not going to find a nicer person to deal with than Mike. Thanks for making this one of the best vacations I’ve ever had! It was absolutely amazing!